Our coastal garden is starting to look really exciting now, with lots of lush growth being encouraged by the warm sunshine. It’s still very leafy for the time of year, with some flowers a number of weeks behind. Our Agapanthus africanus are normally on the brink of blooming by now, but the snake-like heads are only just emerging from the fans of strappy leaves. Something to look forward to in August. I’m braving dahlias for the first time – a bit of a risk considering our snail population and the increasing shade cast by our trees. 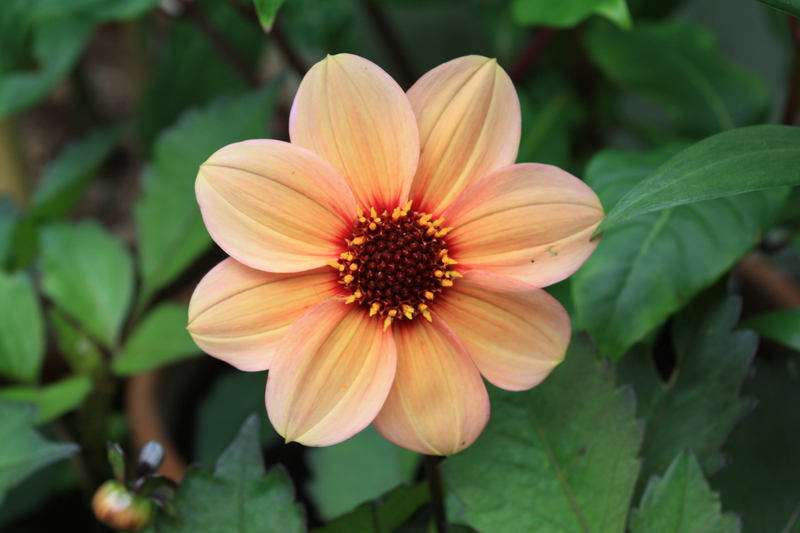 First into flower is Dahlia ‘Happy Kiss’ with its soft peach flowers and blood-red centres. 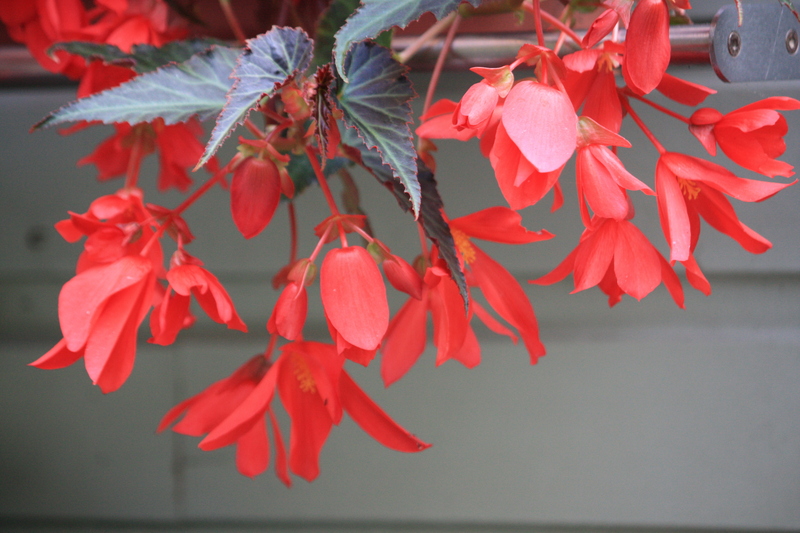 Begonia ‘Illumination Red’ is a prolific grower, already cascading over the shelves of our outdoor kitchen. All four plants survived a bombing raid executed by the young seagulls of Broadstairs. They’re now in bigger, heavier pots to stop them getting damaged again. 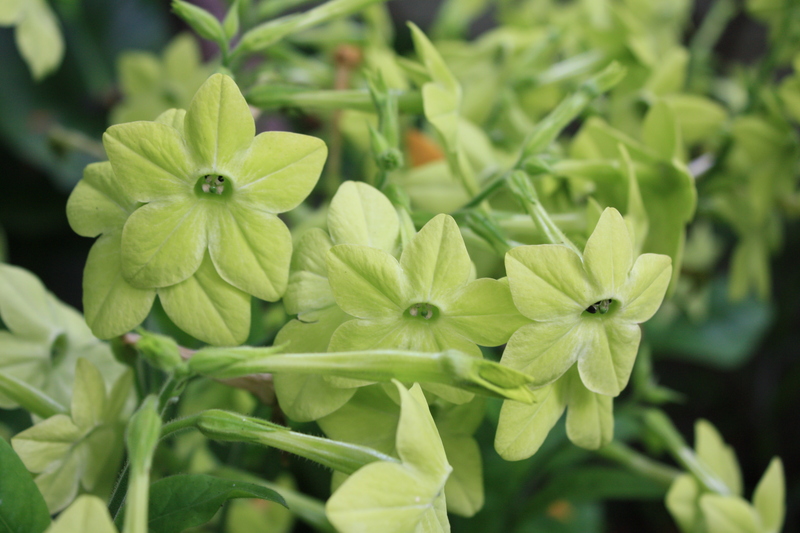 In the cool shade of our evergreen olive, Phillyrea latifolia, a nice clump of aptly named Nicotiana ‘Lime Green’ creates a pool of light. I expected the snails to demolish these within the week but so far, so good! They make an interesting companion for Zantedeschia aethiopica (top) and are equally delicately scented. Two very different Solanums bring a touch of the tropical to the garden. 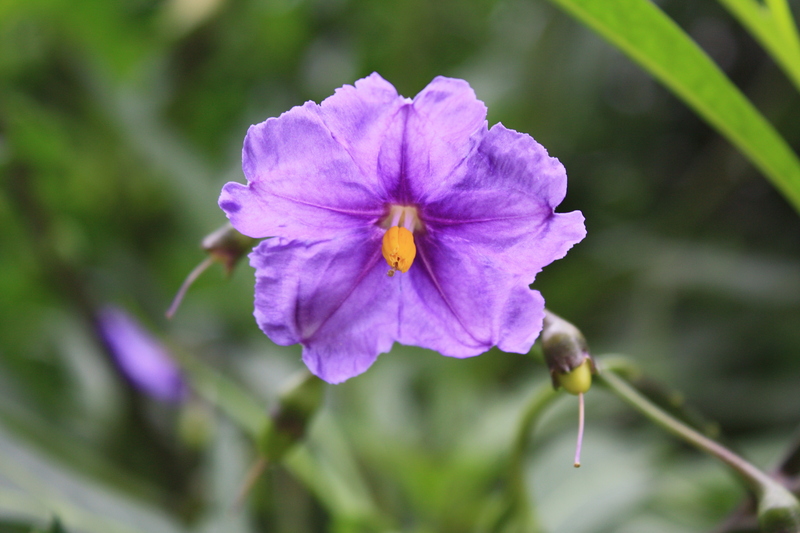 Solanum laciniatum is now 6ft tall and counting, having soldiered on bravely through the winter. I’m looking forward to the edible orange fruits, which should be plentiful if the good weather continues. 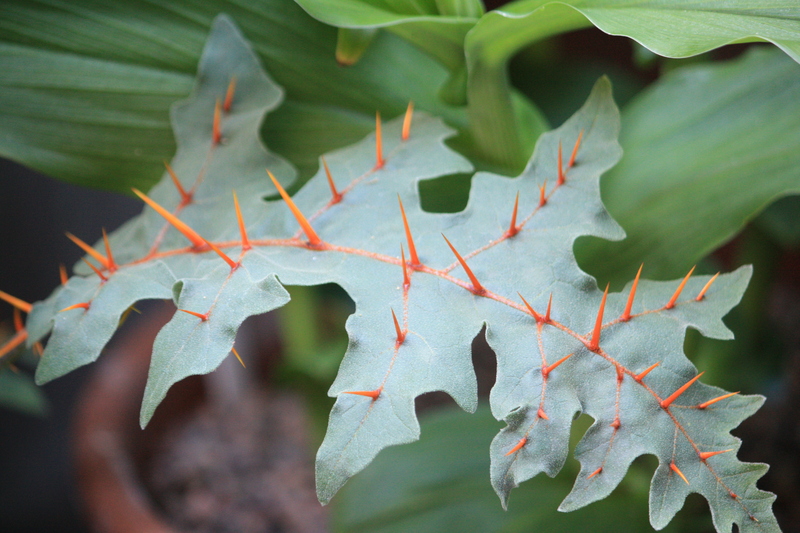 A new acquisition, Solanum pyracanthum is not quite as dangerous as it looks, but what a cool plant. 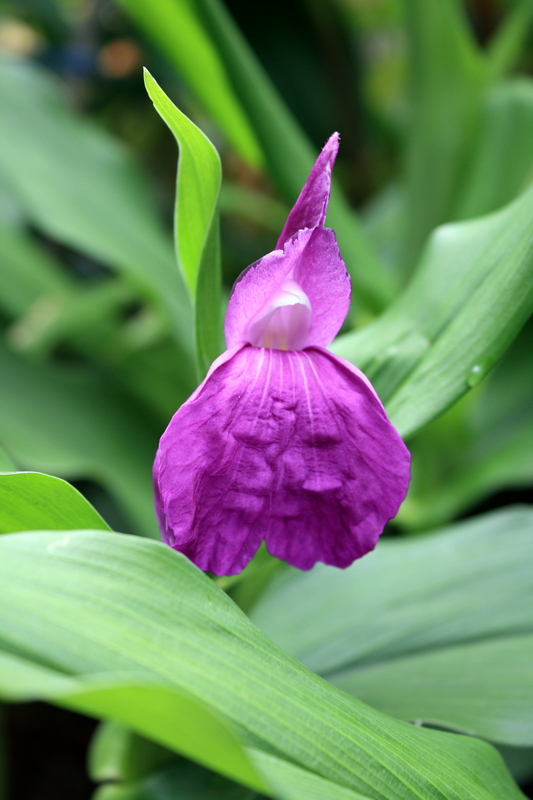 I’m also growing Roscoea purpurea for the first time, in a large pot. The ten plants seem very happy and this weekend we got our first flower. A nice contrast to the hot colours around it. 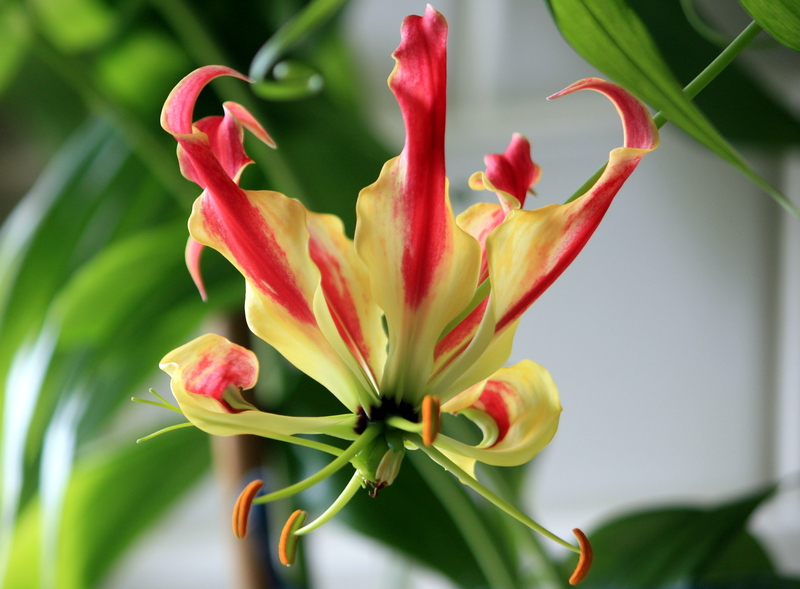 Meanwhile indoors, Gloriosa rothschildiana is going berserk in our bathroom. It had reached the ceiling a couple of weeks ago and is now trying to find a way out through the window. Despite looking untidy, the flowers are the embodiment of exotic. They were meant to be put outside after the danger of frost had passed, but I was too scared of the damage the snails would do to these wonderful, flame-like flowers. 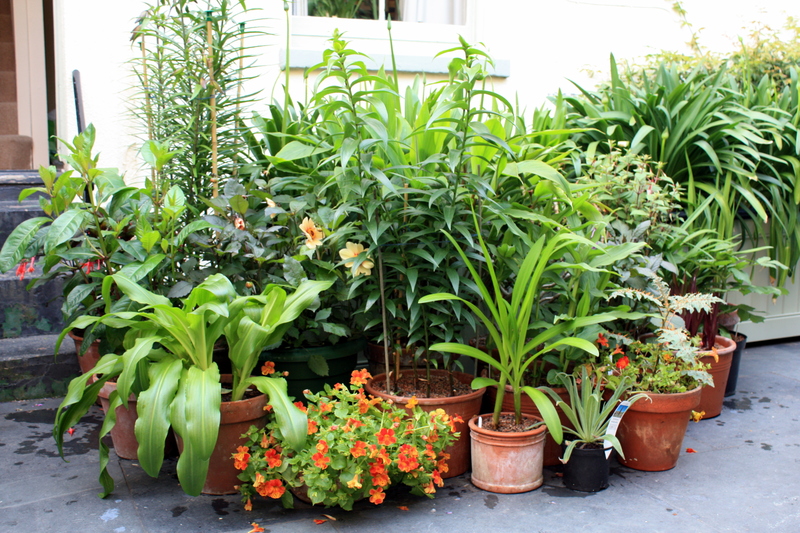 A month ago I posted a photograph of the group of pots near our front door. What progress they have made! Just days now until Lilium Debby and L. ‘African Queen’ start to flower, and then the show really will be on the road. What a show you have going on – the peach and lime colors blew me away. Wow. My ‘African Queen’ lilies have just started to open and have turned the heat up even more! Thank you. It’s all gone a bit wild this week! I love the arum lilies and remember them growing wild around Cape Town, where I lived as a child. 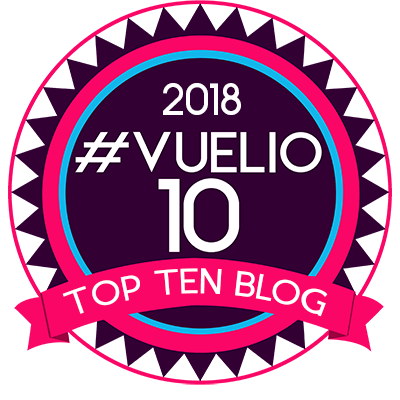 Your other plants are interesting too – thank you! Thank you Candy. I love the arums too – they have such a subtle scent. Sadly the spot they are in is diminishing in size every year, so I have been digging them up and sharing them amongst my friends.